After witnessing the accidental murder of his mother’s lover by his father, young Tommy is so traumatised that he loses his ability to speak or to care about life. As his life meanders on in post-World War II England, he suffers abuse from sadistic relatives and neighbours. Tommy’s life is saved, however, when he falls in love with pinball. He becomes such an expert at the game that he rises to the stature of an international superstar and inspires youth around the world. An embittered young genius stricken deaf, dumb, and blind after a childhood trauma. Tommy discovers that he is a natural master of pinball, and later becomes a cult-like hero figure to masses enthralled by his story. Captain Walker and Mrs. Walker’s son. A weary middle-class woman. Mrs. Walker is tired and frustrated from trying to care for and cure Tommy. Tommy’s mother and Captain Walker’s wife. A former soldier with lingering guilt. He murders his wife’s lover after coming back from a POW camp, resulting in Tommy’s trauma-induced blindness, deafness, and dumbness. Father to Tommy and husband to Mrs. Walker. Captain Walker’s lecherous, drunken brother. Ernie molests a young Tommy and later runs a children’s camp seeking to profit from Tommy’s popularity. Mrs. Walker’s brother and Tommy’s uncle. A bully with sadistic tendencies. Tortures his cousin, Tommy, when they’re young and later seizes the opportunity to profit from Tommy’s success. A bold, sensitive, and excitable teenybopper. Sally develops a fan crush on Tommy and rushes the stage to be close to him. Both roles can be played by either a boy or a girl. Parents should be aware that this show contains adult language and adult situations. A doctor with modern ideas about how to cure Tommy. Tommy’s parents hire him in their desperation to find any cure for their son. Entertaining Angels now fully cast! Copyright © 2016 Sharnbrook Amateur Theatre Trust Limited. All rights reserved. 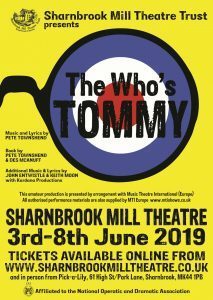 Sharnbrook Mill Theatre Trust is the trading name of Sharnbrook Amateur Theatre Trust Limited, a Registered Charity.